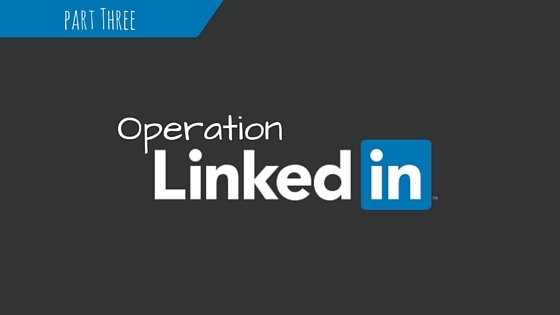 Welcome back to Operation LinkedIn! Today we will be talking about the don’ts and don’ts of LinkedIn, or in other words, the things you should never do. Don’t allow your page to have typos. This may seem pretty obvious, however it is very important to mention. Every typo you have discredits your business. You might as well put up a sign that says, “Hey everybody, don’t buy from us because we don’t know the difference between your and you’re”. Do yourself a favor and run anything you type through a spell checker first. Grammarly is a good choice. Don’t forget to engage. Active participation is key in all aspects of social media, especially your LinkedIn account. Make sure that you are actively posting and engaging with other LinkedIn members. Remember that your account is reflecting your business, and no one wants to be perceived as uninvolved and uninterested. Treat your profile as you would a table you’re setting up at an event to promote your business. Would you stand there quietly in the corner, refusing to talk to anyone? No, of course not. So why do the same with LinkedIn? Don’t forget to monitor employee profiles. It is important to make sure your employees are connected with your business on LinkedIn. To do this make sure your employees choose your company on their LinkedIn page. It’s also important to monitor what your employee’s are posting. Your employees represent your business, so keep in mind that what they post may affect your brand’s image. Don’t forget to use your page stats. Page stats are an extremely useful tool provided by LinkedIn to monitor how well your page is doing. For example, you can see how much engagement your posts have, as well as how many followers were acquired or clicks that you received. This is extremely useful for understanding which posts work for your followers and which do not. Page Stats also provides you with follower demographics, as well as tips on how to get more followers on your page. To see page stats go to analytics next to your home button. We hope that you found our don’ts and don’ts helpful! Make sure to subscribe and tune in tomorrow where we’ll be discussing ways to improve your follower base.